Cirencester Hospital researchers have published a study which suggests ultrasound might be almost as good as X-rays for diagnosing minor fractures. Ninety-seven patients with suspected fractures, over the course of 12 months, consented to having their injuries imaged with sound waves as well as the routine X-ray assessment. Ultrasound is much more convenient than getting an X-ray - it can be done at the bedside and requires only minimal training. It's less distressing and painful to the patient too, and allows for limbs to be compared without worrying about additional radiation exposure. It also offers an alternative for when x-ray units are closed. The results showed 62% of patients scanned had fractures confirmed by X-ray, and 85 percent of those patients' fractures were subsequently detected by ultrasound. 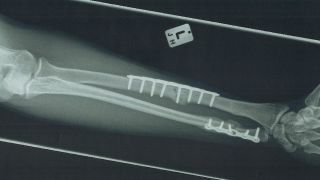 When it came to arm fractures, the percentage rose to 87%. Authors Salam Musa and Paul Wilson said that the data indicated fractures could be ruled 'in' by studying ultrasound images, but that ruling fractures 'out' is still the job of radiologists. They added: "The study suggests that ultrasonography is a reliable way to detect fractures [...] and it is reasonable to conclude that portable ultrasound devices will play an increasingly significant role in the assessment of patients with suspected minor or even subtle fractures in emergency care settings." The study was published in the journal Emergency Nurse.